of a Pack of Endangered Orcas. When she was seen near San Juan Island in September, she did not look good. Researchers from the National Oceanic and Atmospheric Administration's (NOAA) Southwest Fisheries Science Center and Vancouver Aquarium noted J2's "thin body shape" and "relatively poor" condition. One thing that distinguishes southern residents from other kinds of killer whales is that southern residents eat only salmon. In fact, 80 percent of the southern resident diet is specifically Chinook salmon -- and just like the southern residents themselves, Chinook salmon is on the endangered species list. There used to be plentiful Chinook salmon in local waters, especially where the Columbia River meets the Pacific Ocean and where the Fraser River meets the Salish Sea, but now wild Chinook is scarce. J45's mother had just died, which explains why J2 was helping her find food. 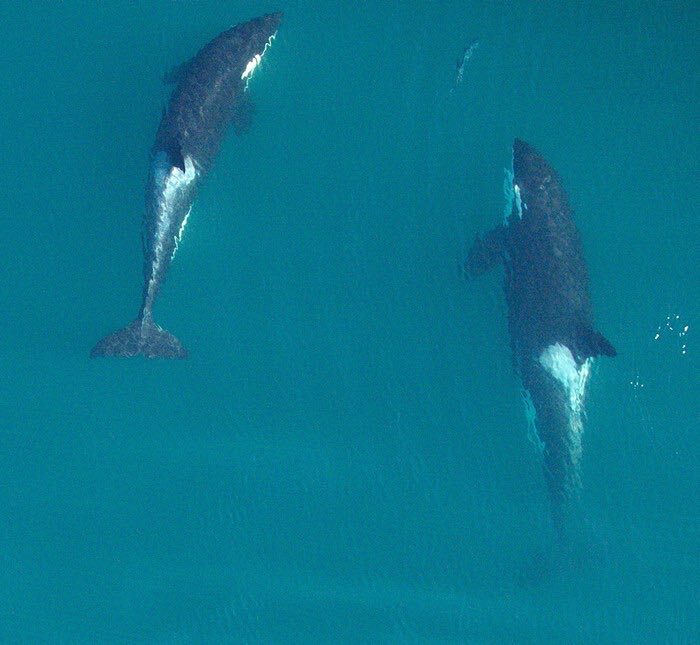 Southern resident offspring stay with their mothers their entire lives -- another characteristic that sets them apart from other killer whales -- so an orphan like J45 would be adrift without mom around. "They are incredibly bonded animals. They don't disperse," Dr. Giles said. "It's not like elephants, for example, where the males disperse from mom, and even females sometimes disperse from mom. With the southern resident clan, it's not that way. They all stay with their families their entire life." Granny was seen again in mid-October. Then in late October, scientists saw something they weren't used to seeing: Granny's relatives swimming around without her. This was highly unusual. "J2 was often the animal that was in the lead," said Dr. Giles, who has seen her in the wild "hundreds" of times. 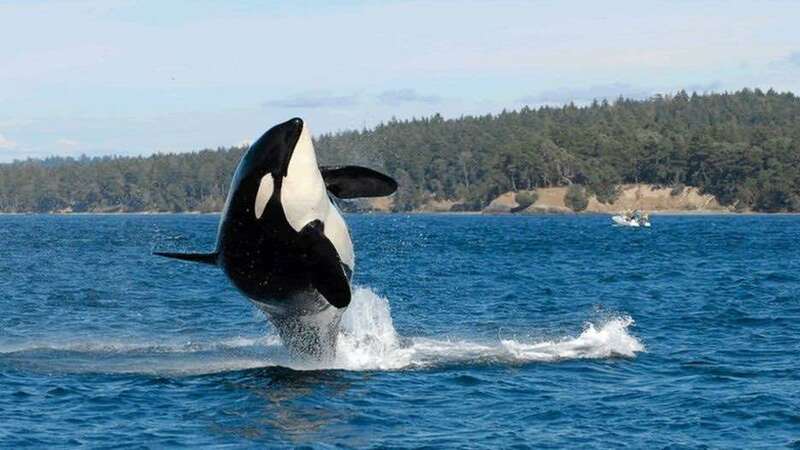 "And there were multiple, multiple times -- it's been documented -- where J2 would decide to go up a particular passage, and maybe some of the other whales were meandering a different way, and she would just stop in the water and start slamming her tail on the water. It's called tail slapping... When she was around, if she wanted something to happen, she would make it happen." The Center for Whale Research marked J2 down as missing. "The general rule is, there are three encounters where they should be there and they're not," said Garrett. "The center tries to be very conservative about it and not set off any alarms until they're absolutely sure." In November, there was another encounter with J2's family, and J2 was still missing. In December, there was another encounter -- and again, no J2. "That was enough," Garrett said. "We knew she was gone." The oldest living orca on record, an icon of her species, was dead. The news devastated activists and animal lovers, and it underscored a bigger environmental problem that political leaders don't seem eager to address -- a problem affecting all southern residents and their prospects for future survival. Another change Granny would have witnessed over time was "the decimation of fish in the region," said Dr. Giles. "When she was young, there would have been fish that were 120-plus pounds -- fish that were massive. That's what these whales evolved to eat. You think of a massive carnivore like a killer whale, and you think: Gosh, how can it be that they eat just fish? When we think of fish these days, we think of a 30-pound Chinook salmon as massive, and those are teeny, those are itty-bitty compared to what these whales evolved to eat. But that's still what they're looking for." Chinook is the biggest of the salmon species and the richest in fat content. But for Dr. Giles, it's a no-brainer. She points out that there are other populations of orcas seen in Puget Sound -- for instance the mammal-eating transient orcas that like to eat seals (by skinning them alive) -- and those orcas are thriving, in spite of pollution and vessel noise, unlike the southern residents, whose population is "not increasing." Southern residents "are losing a tremendous number of their young, before they're even born." The difference? "The southern residents don't have food." "The Columbia River basin -- and the Snake River watershed in particular -- holds the greatest promise for restoring significant numbers of Chinook in the near term," according to Save Our Wild Salmon, a coalition of advocacy groups. "For this reason, orca scientists and advocates increasingly support calls to remove the four costly lower Snake River dams." For decades, those four dams -- Ice Harbor, Lower Monumental, Little Goose, and Lower Granite -- have generated cheap hydroelectric energy for the Bonneville Power Administration. The power created by Bonneville's dams was credited by President Harry Truman as being essential in the allied victory in World War II. Back then, cheap power "was instrumental in the ramp up of the Northwest aluminum industry," Bonneville's website states, which in turn allowed Boeing to manufacture "over 10,000 combat airplanes." When asked what people can do to help the southern residents, Howard Garrett, of the Orca Network, said, "Our real push is the Snake River dams. On social media, we're calling on people to call Inslee, Murray, and Cantwell's offices. The word we have is that they are the holdouts." He added, "The state political backwater of resistance -- pun intended -- just don't want to see those dams come out. They're just married to them as monuments to our greatness, or whatever it is. The rationales for keeping the dams are riddled with falsehoods."